Note to Instructors: This applet generates practice problems of this type where the y-intercept IS an integer. Feel free to print a copy of the PDF that can be found below the applet. 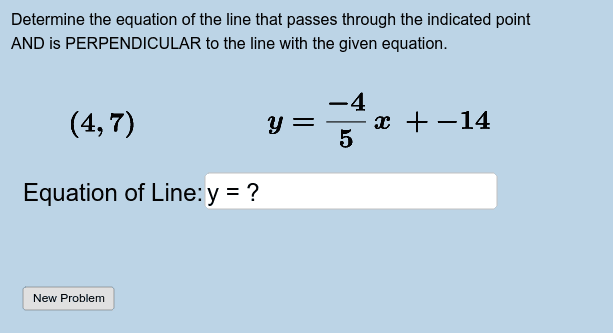 Students: 1) Determine the equation of the line that satisfies the specified criteria. 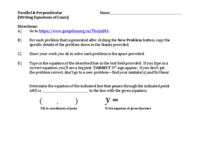 2) Type this equation into the input box provided. (Be sure to type EXACT VALUES of parameters!) 3) If your equation is correct, you'll see a big "CORRECT!" sign appear. 4) Click the "New Problem" button to generate a new problem. 5) Repeat steps (1) - (4) as many times as you need in order to master this concept!